Complications TV show on USA: canceled or renewed? Performers include: Jason O’Mara, Jessica Szohr, Lauren Stamile, Chris Chalk, Beth Riesgraf, and RonReaco Lee. This dramatic series revolves around a disillusioned suburban doctor John Ellison. 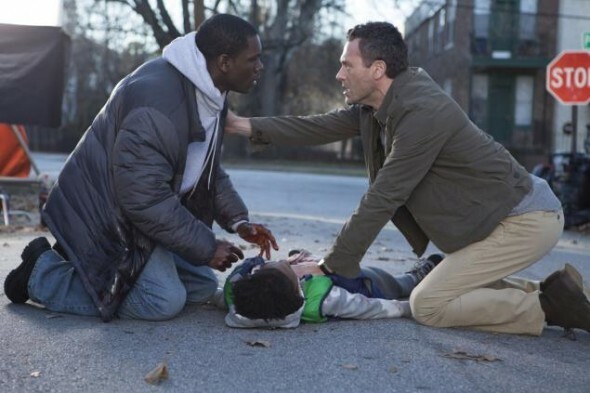 While still dealing with the emotional effects of his 8-year-old daughter’s death from cancer, he unexpectedly becomes a vigilante hero when he intervenes in a drive-by shooting, saving a 12-year-old boy’s life. When John learns the boy, Antoine Tyler, is still marked for death, he’s compelled to save him at any cost. Through this journey, he must compromise his morals, often doing the wrong thing for all the right reasons. A committed and compassionate ER doctor at Samaritan hospital, John Ellison (Jason O’Mara) is guided by an unswerving belief in his responsibility to help his fellow man — no matter the cost. That philosophy has often left his wife and son feeling abandoned. Now, in the wake of Antoine’s shooting, John starts to cross lines he never thought he would cross. Even as he compromises his once-firm principles, John continues to believe that all the risks he’s taking are for a greater good — to protect his family and save lives. It becomes increasingly clear that Doctor Ellison’s patients aren’t the only ones in need of healing. Samaritan ER nurse Gretchen Polk (Jessica Szohr) is a wild card both inside and outside the hospital. She’s got a quick temper, impulse control issues, and courage that borders on recklessness. Getchen is also John’s most indispensable ally in protecting Antoine. Though she prefers women to men, Gretchen doesn’t really seem to like (or trust) anyone. But as tough-talking as this tattooed former foster kid may be, in truth she’s got a big heart and fierce protective instincts. The supervisor of the Samaritan Emergency Department, Doctor Bridget O’Neill (Lauren Stamille) is a conscientious and principled doctor who operates strictly by the book and expects others to do the same. Her careful watch over the ED only further complicates John’s situation. However, as tightly wound and emotionally reserved as she may seem, Doctor O’Neill isn’t entirely without compassion. John’s friend and colleague in the Samaritan Emergency Department is Doctor Quentin Harper (RonReaco Lee) — a dedicated ER doctor who also has a powerful sense of duty to his patients. Intuitive and quick with a smile, the natural-born peacekeeper is a loyal friend and a calming presence among the patients and staff of the ED. He manages to roll with the punches and somehow remain lighthearted despite the daily challenges he faces — thanks in part to having an unshakable faith in God’s plan. John’s wife and the mother of their young son is real estate lawyer Samantha Ellison (Beth Riesgraf). She’s been valiantly struggling to move forward and keep her family together in the wake of her daughter’s death. Still processing her grief (and harboring a secret of her own) Sam is growing increasingly concerned about John’s well-being, and the toll his actions may be taking on her family. Strong, smart and determined to protect the ones she loves, Sam isn’t willing to sit idly by and let her husband shoulder his burdens alone. As much as she wants to support John however, the truth might be more than she is willing to accept. Second in command of Atlanta’s powerful Vine City Crew, Darius Bishop (Chris Chalk) was handpicked by the gang’s leader, Ezra “EZ” Tyler, to run the ground operation while EZ is in prison. He’s also been tasked with watching over EZ’s 11-year-old son Antoine — a duty that makes him John’s main point of contact with the gang. Smart, ambitious, and ruthless, Darius is a natural leader, commanding respect and fear in equal measure. he can also be as vengeful, violent, and deadly as they come. Back in the present day, John and Samantha Ellison are dealing with the fallout from their own mistakes. Though the revelation of Sam’s affair haunts John, for now he’s got to focus on his meeting with the cops. Despite prodding by Detective Holden and his partner, John won’t reveal much until he can talk directly to the DA and get a protection deal for his family. But when Gretchen stops by Blair Surgery Center to check on Antoine shortly afterwards, she’s shocked to see Holden arriving and taking a gun with a silencer out of an evidence bag in his trunk. Clearly something John let slip tipped him off—and clearly something isn’t right with this cop. She calls John, and while Samantha and Ollie flee to the lake house, John races to help Antoine. Back at Blair, Gretchen tries to hide Antoine and keep Holden off the scent while she waits for John and Darius to arrive. When they do, Darius begins to put the pieces together, realizing that Holden must have been the one behind the stash house robbery that kicked off the whole Vine City Crew-Nortenos Locos gang war a month earlier. First aired: August 13, 2015. What do you think? Do you like the Complications TV show? Do you think it should have been cancelled or renewed for a second season? great show. why do they cancel the good ones. Loved the show – looking for another season or two !!! I loved Complications.You need to bring it back for another season! Loved the show and was looking forward to Season 2. Seems like the good ones do not last. I really enjoyed this show and was looking forward to a new season. Too bad USA network big wigs disagree. I don’t know exactly who makes these decisions and why- but a show as enjoyable as that should have merited some marketing intervention before pulling the plug. If FX can keep “Anger Management” going for as long as it has, based upon 1 single attribute- then you didn’t correctly capitalize on the “pull” you had going for you….Content, quality acting, visual desire and unique story line. Out of drama,and mystery series- you were up there with Suits and Elementary…to me and my family. Very sad and disappointing Bring it back and I will spread the word. Loved Complications!! Working in a hospital, this show was so on point to real issues of today! Wish someone would pick up another season of Complications!